The cosmetic industry is one of our core markets. We understand the high quality and visual requirements needed to sell your products to discriminating buyers. 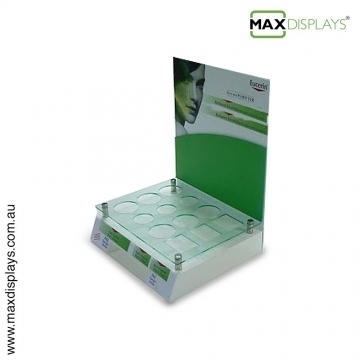 Be it Point of Purchase displays, salesperson's kits, personal workstation trays or simple clamshells and blisters, Max Displays understands your needs and quick turn around requirements. We are manufacturer and supplier of cosmetic packaging material and products.Through constant innovation and ongoing investments in state-of-the-art design and production capabilities, Max Displays has developed a long track record of delivering clean, reliable, high-quality parts to our customers. Max Displays specialises in the design and production of high quality cosmetic packages. Through commitment with quality, cutting-edge technology and innovation, we have found a foothold in the industry. Our splendid range of products is of high quality and endurance. We upgrade our technology to face the global challenges and to meet the exact requirements of our clients. Feel free to browse few of our photos or give us a call with your ideas or sketch for us to take it further to a finished product.